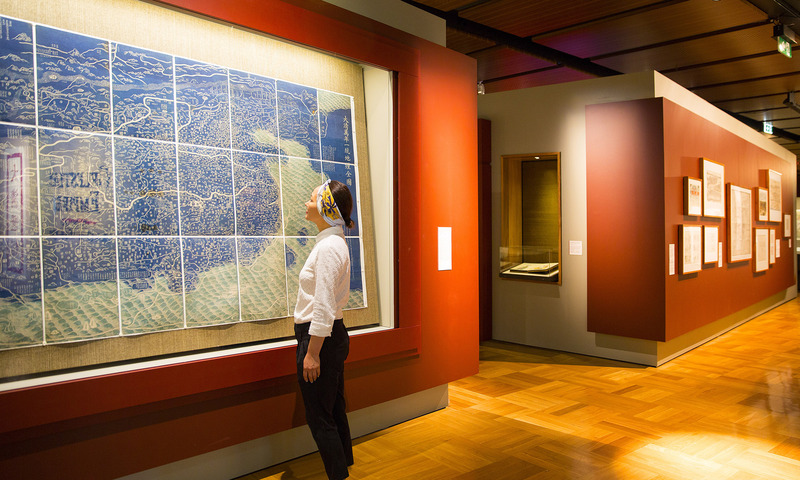 Celestial Empire brought together precious objects from the National Library of China and Yangshi Lei Archives with the National Library of Australia’s acclaimed Chinese collection. The exhibition explored 300 years of Chinese culture and provided a unique view of early western impressions of China. Artefacts included drawings and plans for Beijing’s iconic Forbidden City and Summer Palace drawn from the Yangshi Lei archives and listed in UNESCO’s Memory of the World Register. The exhibition highlighted the rich Chinese cultural tradition and presented a multifaceted view of the imperial court, bureaucracy and common life. The interpretation of the approximately 200 objects allowed a view into the lived experience of people in the Qing Dynasty and gave a unique opportunity for audiences in Australia to understand the last Chinese Dynasty succeeded by the Republic of China in 1912. The design of the exhibition included the use of dramatic deep red temporary wall planes to divide the heritage gallery into separate and connected spaces. The material palette included raw silk and vertical wall hangings featuring Chinese calligraphy and map textures. The central room of the gallery included an interactive map touch table in which visitors could explore a detailed archive of materials. Thylacine played a substantial role in the graphic development of the exhibition from start to finish including creative concept development, visual identity for exhibition branding and exhibition graphic design through to the production of promotional materials.